1. prepare the salt fish by either soaking over night or boiling, I chose the boiling method. Place in a pan with enough water (approximately 6 1/2 cups) to cover the saltfish and bring to the boil for 10 minutes, drain the water then repeat the process this time with a little less water and leaving for 1/2 hour then drain. 2. flake the salt fish using your fingers or a fork then set aside in a large bowl. 3. Finely chop onions, spring onions, garlic, thyme and parsley (ensure that the thyme and parsley stalks have been removed and discarded prior to chopping). 4. Place all the ingredients, including the chopped ingredients, into the bowl with the salt fish and mix until you have a thick batter. 5. Heat a large pan of sunflower oil to a medium heat. 6. Place teaspoon fulls of the batter into the oil (they will sink to the bottom then float so don't worry) heat until golden brown ensuring to turn them regularly to avoid the outside browning before the inside is cooked. 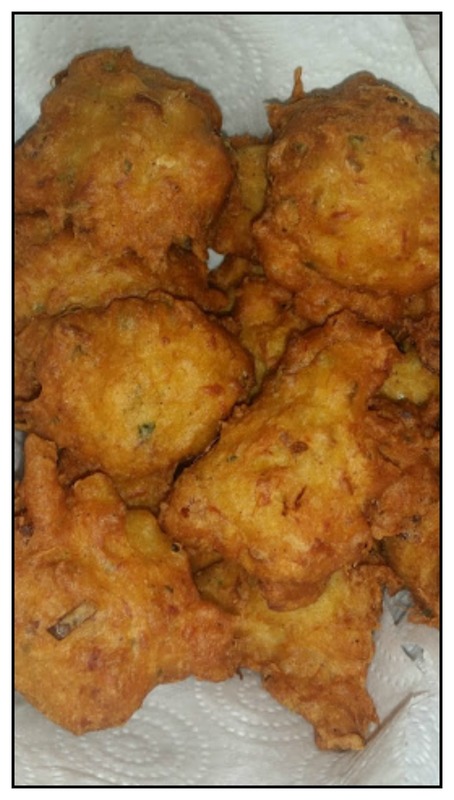 Have you had bajan fish cakes before? Enjoy! Don't forget to come back and let me know how you got on.